We have interests in offshore production and exploration licences in the North West Shelf (NWS) and Greater Gorgon areas of the Carnarvon Basin, as well as in the Browse Basin and Timor Sea. Some of these interests are held directly and others indirectly through a shareholding of approximately 23% in Woodside Petroleum Ltd (Woodside). All interests in Australian assets quoted below are direct interests. Woodside is the operator of the Pluto LNG Project which produced its first LNG in 2012. Woodside is also the operator on behalf of six joint-venture participants of the NWS gas, condensate and oil fields, which produced more than 470 thousand boe/d in 2012. Shell provides technical support for the NWS development. We have a 50% interest in Arrow Energy Holdings Pty Limited (Arrow), a Queensland-based joint venture with PetroChina. Arrow owns coalbed methane assets, a domestic power business and the site for a proposed LNG plant on Curtis Island, near Gladstone. In January 2012, Arrow completed the acquisition of coalbed methane company Bow Energy Ltd (Shell-share consideration $0.3 billion). We have a 25% interest in the Gorgon LNG project, which involves the development of some of the largest gas discoveries to date in Australia, beginning with the offshore Gorgon (Shell interest 25%) and Jansz-lo fields (Shell interest approximately 20%). It includes the construction of a 15.3 mtpa LNG plant on Barrow Island. We are the operator of a permit in the Browse Basin in which two separate gas fields were found: Prelude in 2007, and Concerto in 2009. We are developing these fields on the basis of our innovative FLNG technology. The Prelude FLNG project is expected to produce about 110 thousand boe/d of natural gas and NGL, delivering approximately 3.6 mtpa of LNG, 1.3 mtpa of condensate and 0.4 mtpa of LPG. During 2012, we commenced construction of the Prelude FLNG project and completed the sale of a 17.5% interest to INPEX and a 10% interest to KOGAS. We also completed the sale of a 5% interest to CPC Corporation in the first quarter of 2013, reducing our interest to 67.5%. We formed a joint venture to operate the Crux gas and condensate field (Shell interest 82%). We also operate the AC/P41 block (Shell interest 75%). We are a partner in the Browse joint ventures covering the Brecknock, Calliance and Torosa gas fields. During 2012, we increased our interest in the West Browse joint venture to 35% and in the East Browse joint venture to 25%. 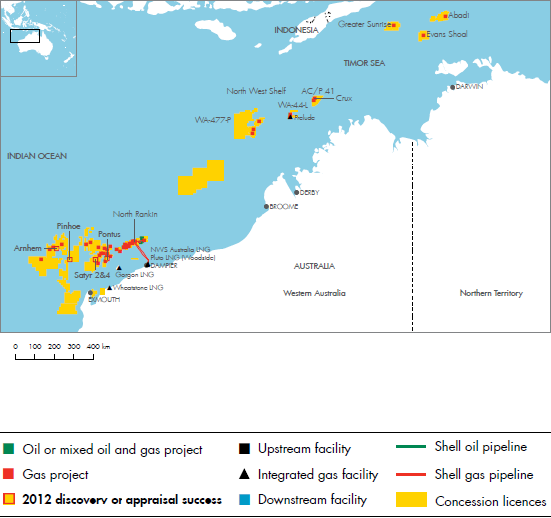 The Browse resources are being assessed for development on the basis of an LNG export project. In the Timor Sea we have a 26.6% interest in the Sunrise gas field. The joint-venture partners have selected FLNG as the preferred development concept for Sunrise. The development is subject to approval from both the Australian and Timor-Leste governments. 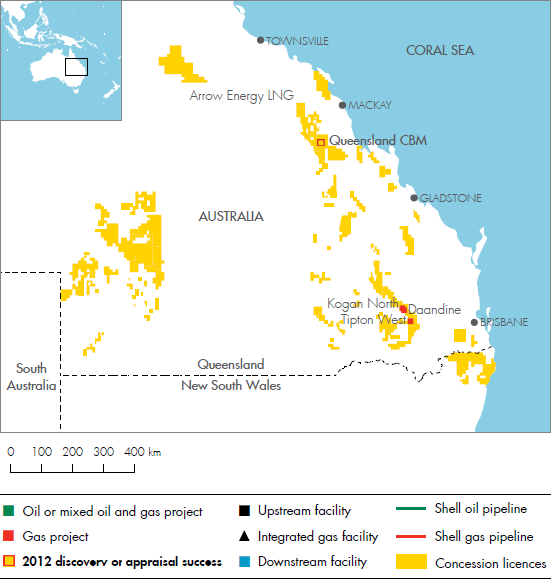 Shell is a partner in both Shell-operated and non-operated exploration joint ventures in multiple basins including the Bonaparte, Exmouth Plataeu, Greater Gorgon, Outer Canning and South Exmouth. We also hold a 6.4% interest in the Wheatstone LNG project, which includes the construction of two LNG trains with a combined capacity of 8.9 mtpa.